"The Wakefield Common as it appeared near the end of the 19th Century. The icehouse is at the left of the picture. In the 'Handbook of Wakefield - a strangers' guide and residents' manual' written by Will E. Eaton and published in 1885, the 'park' was described as follows: 'If there is any one thing of which Wakefield may justly feel proud, it is her fine Park. The special features, aside from the artistic manner in which it is laid out, the careful manner in which it is tended, and its very central location, are its noble trees and the scenery afforded by the adjoining lake and distant views of forest and hills. Seats are conveniently located under the shade trees, and serve as enjoyable resting places for thousands during the year.'" -- Text from calendar by Jayne M. D'Onofrio. 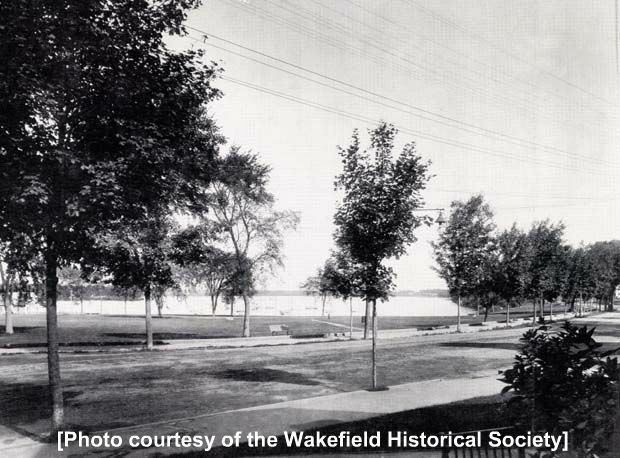 “Wakefield Common, circa 1893,” NOBLE Digital Heritage, accessed April 20, 2019, https://digitalheritage.noblenet.org/noble/items/show/7118.